Looks like there's drama between Consumer Reports and the Honda Civic yet again! How sad. They had just become friends again. You'll recall that Consumer Reports dropped the mediocre 2012 Honda Civic off their "Recommended" list, leading to an emergency refresh for the 2013 Civic. That seemed to do the trick, as the little grocery getter earned accolades for its improved interior and driving dynamics. But now the Civic is back in CR's targets again, this time for its hybrid model. The magazine's April 2013 issue says that the Honda Civic Hybrid "has a big problem with its battery." Oh, snap. 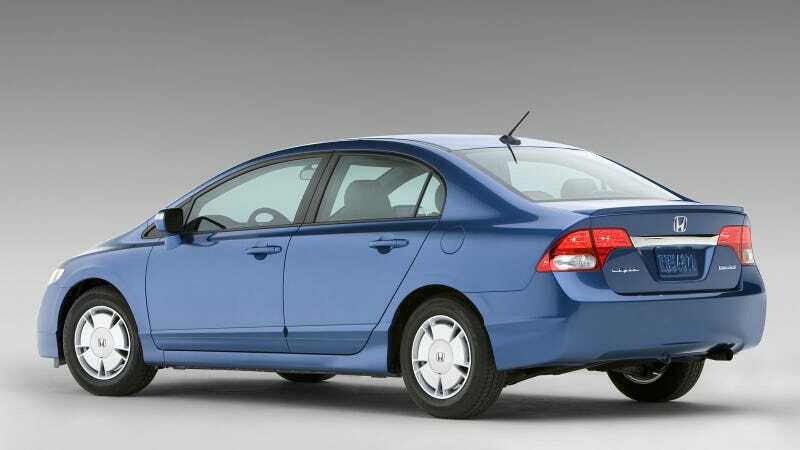 It's not the most recent Civic Hybrid that has issues, but older ones, according to the magazine. Specifically, the 2009 model, where almost one in five owners needed a battery replacement in their 12-month survey. Also, "more than 10 percent of owners of the 2003, 2004, and 2010 models also needed one," CR said. A not-under-warranty battery pack replacement can cost between $2,000 and $4,000. Honda has issued a software update to protect older hybrids from battery failures, and they extended the warranty on the battery in 2012. This is just yet another reason to wonder what's going on over at Honda, a company that built its reputation on reliability and dependability. They've already sacrificed nearly all of the sporty cars that made them so loved. Let's hope quality isn't next.